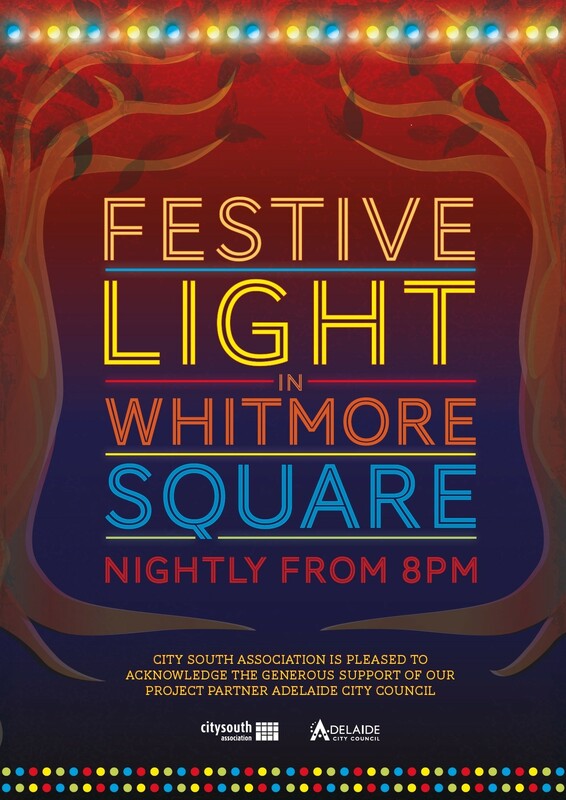 CitySouth Association – Festive Lights in Whitmore Square are up until the end of Fringe! 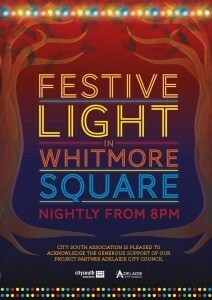 CitySouth Association / Current Projects & Events / Festive Lights in Whitmore Square are up until the end of Fringe! The Festive Lights display in Whitmore Square has now been installed, with this year’s display our most spectacular to date! Our new colour-changing LED bulbs are being used for the first time along the entire length of the Festoon runs in addition to the large floods at each end of the Square and the colour changing spots on selected trees within the Square. The lights will stay up to the end of the Festival season in mid-March. In addition to the lights, this year City South will be Yarn-Bombing poles and seats in Xmas themed colours and designs from Nov 28 to Jan 5.